My friend Mari issued a challenge on her blog to do something this week you have pinned on Pinterest and share it with everyone. Are you on Pinterest yet? If so, don't you love it?! If not, you will love it! Let me know if you need an invite. Anywho... 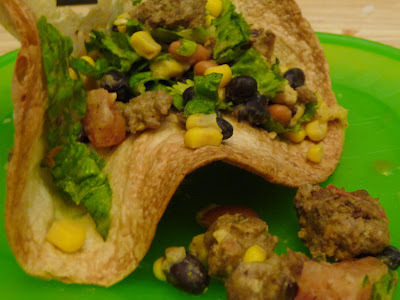 I pinned these cute mini taco bowls a while back and thought I'd give them a whirl. I decided to share them with you guys here since this is a food blog, after all. Mini Taco bowls Directions: 1. Preheat the oven to 375. 2. Sprinkle each tortilla lightly with water and stack them on a plate. Cover the top with another plate turned upside down and microwave the tortillas for 1 minute or until warm. Turn two 12 cup muffin pans upside down. Mist each side of a tortilla lightly with cooking spray and center it in the space between 4 muffin cups, creating a bowl. Repeat with the 5 remaining tortillas, forming 3 bowls on each tin (as pictured above). Bake in the oven for 8-10 minutes. Here we are making them. I always have little helpers in the kitchen...unless something more exciting is on TV. My kids always ask me if they can watch "Netflakes". Flix, kids, flix. Not flakes. Ahem. Moving on. 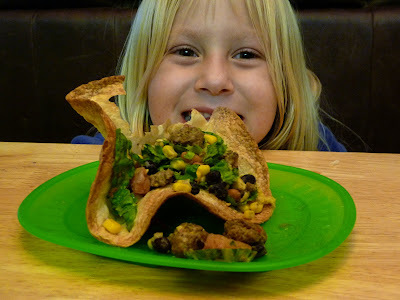 We filled the bowls with my favorite taco salad recipe. It's different every time I make it, but the dressing is always the same. This time I put in the salad black beans, pinto beans, corn, red bell pepper, romaine lettuce, tomato, cilantro, hamburger cooked with taco seasoning, and mango. The mango was SO delicious in there. It added a little sweetness that was SO good. I forgot to get pics of the bowls before everyone started eating, so imagine it without a bite out of it. I've made this pasta salad couple of times. It is so easy and so yummy! And, it's even better the next day! The recipe is from Food.com. It makes a ton, so for my family of 5 (2 adults and 3 6-year-olds) I usually cut the recipe in half. Enjoy! Combine first 4 ingredients in a large bowl; toss gently. Combine mayonnaise and next 6 ingredients; stir well. Add dressing to salad and toss gently. Serve immediately. I made this for dinner tonight, and it was SO good! The marinade was so easy and yummy. The salsa was great, with just a little bit of heat. The original recipe called for corn tortillas, but we ate it with flour because that's what we prefer. We also made coconut rice to go inside the tortillas. To make coconut rice, just add some cream of coconut to cooked rice until it tastes right. You want to be able to taste the coconut, but don't want it to completely overpower the rice and be too sweet. Oh, and FYI-- You can find cream of coconut in the aisle with the margarita mixes and stuff like that. Sometimes it's in the Mexican food aisle, too. So, you should definitely try this recipe. 5 stars! I have several recipes that call for cream of mushroom or cream of chicken soup, and I was thinking to myself that there must be an easy way to make it yourself with fresher ingredients. I did a little Google search and stumbled upon THIS thread where someone asked the same question. There is a lot of great info in the thread, including instructions for making a basic roux and Bechamel sauce, as well as a recipe for dry soup mix that you can make a big batch of and store, then just add water to some of the mix and cook it when you need a can of cream-of-whatever soup. Anyway, just thought I'd pass that along to you guys. Happy cooking! "That's alright. I make lamb." The other night I was trying to decide what to make for dinner, and as I was looking through the freezer I found some ground lamb. We hadn't had lamb in a long time, so I thought that sounded like fun to make. Now, I just needed to find a good recipe! Well, I found one on food.com. It was SO good, especially if you like curry powder. Yum! Here's the recipe. "This recipe is great for just about anything you want to fill or top. Use it over rice, serve it in Pita's with Feta Cheese, fill pastry shells, or even have it on toast! It is very flavorful and has an Indian Flair to it." 2 tablespoons your favorite curry powder ( I use Rogan Josh) - I think I put in more than this. The more curry the better, right?! 3/4 cup red wine or 3/4 cup beef broth - I used chicken broth, because I was out of beef broth. Return lamb to skillet and add tomato paste and broth or wine. - I ended up adding quite a bit more chicken broth, because my pan was so hot that it all evaporated/boiled out/whatever really fast. Reduce heat and let simmer for 10 to 20 minutes, or until flavors have blended and liquids are thickened. * To serve, I put about an ounce of meat into a mini-phyllo shell, then cooked it in the oven for 3-5 minutes like the package said, just until the shells were golden brown. The kids thought it was fun, and they each ate at least two, even my picky daughter! The flavors were so good, and there was none of the gamey-ness usually associated with lamb. I'd like to try some of the serving ideas given by people who reviewed the recipe on food.com. Some of their ideas of how to use this terrific meat were awesome. . I went to a ladies church activity a while ago about health & fitness. One of the speakers shared a recipe for Squash Apple Soup that she loves, and it only has 97 calories per 1 cup serving! I was telling a couple of friends about it, so I thought I'd post it here for everyone. 1. Saute celery, apple & onion in oil & butter until tender. Stir in garlic, poultry seasoning, salt & pepper; cook 1 minute longer. 2. In a blender, combine 1 c. broth and vegetable mixture; cover & process until smooth. Return to pan; add squash and remaining broth. 3. Heat through. Serve with croutons & grated Parmesan cheese if desired.